Galaxy, a female Great Dane, in the arms of her new owner. A woman has been charged with cruelty to animals after an emaciated Great Dane was reportedly found in her Bloomingburg home. Fayette Regional Humane Society (FRHS) agents recently responded to the home on reports from citizens concerned about the welfare of a dog inside of a residence. Humane agents discovered the dog, named Galaxy, with her spine, ribs and hipbone showing prominently. The dog was transported to the FRHS clinic, where she weighed only 66 pounds, had internal parasites of round worms, and according to a veterinarian, had bilateral entropion with inflammatory change in her eyes. A veterinary technician said the dog’s body was covered in dried urine and feces. Brittany R. Scott, 28, was charged with two counts of cruelty to animals relating to the lack of nutrition and veterinary care of the dog. She was arraigned in Washington C.H. Municipal Court on Wednesday and pleaded “not guilty” to the charges. Galaxy was nearly 25 pounds underweight for her size, according to FRHS executive director Dr. Lee Schrader. She has been treated for the internal parasites, had surgery to correct the entropion, and has gained 10 pounds since being under FRHS care. 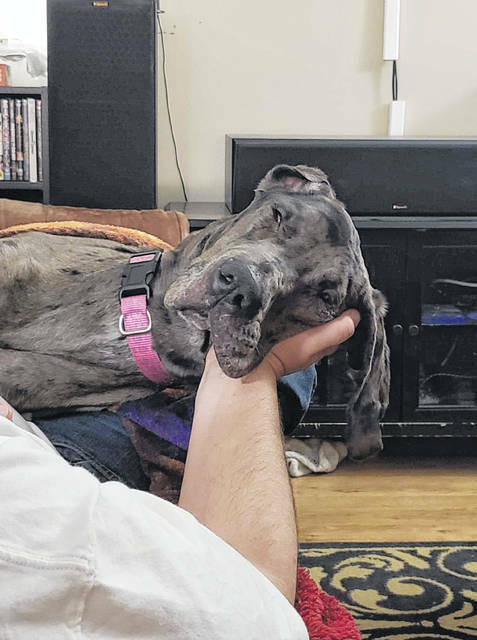 https://www.recordherald.com/wp-content/uploads/sites/27/2019/01/web1_received_2185702885076460.jpegGalaxy, a female Great Dane, in the arms of her new owner.